At the foot of Keefer Street in 1913 you would have been confronted with the smell, dirt and dust of the Vancouver Gas Company’s coal gas plant. The street was nothing more than a dirt track from Main Street to the edge of False Creek. There was no Columbia Street south of Pender Street, just the creek. On the gasworks site is one of the British-built gasometers from John Coates and Company of Downington, England which was shipped to Vancouver in 1905. The gas company sold coke, a byproduct from burning the coal to release the gas, for $7.00 a ton. Residents were concerned about the dangers of a fire and or an explosion of the gas holder, but the company assured residents at a 1912 public meeting that it was safe and gas holders were found in many congested neighbourhoods. The three storey building in the foreground of the image is the Chung King, one of three Chinese theatres in Chinatown. 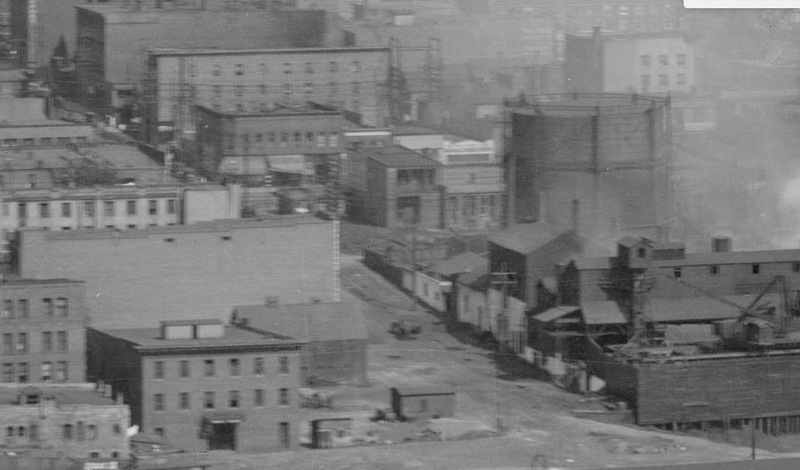 Out of frame, the view would have been the newly constructed Georgia Viaduct, the Vancouver Steam Plant and other industry. Today, the Keefer Bar occupies the one remaining structure belonging the the Gas Company, that’s the big blank wall behind the Chung King, and the gasworks site is now home the the parking garage and the Chinatown neon sign. Just a brief note to say that I like what you are doing.